Ocala's Good Life is a glossy full-color bi-monthly magazine available throughout Ocala and in select locations in The Villages. Focusing on matters important to today's retirees, Ocala's Good Life understands that baby boomers want more out of retirement. It’s all about a lifestyle. It’s grabbing a burger and beer with your buddies at the golf course grille. It’s lounging by a pool that looks like a resort. It’s dancing with the love of your life. Watching concerts. New hobbies. New friends. Travel. The good life. 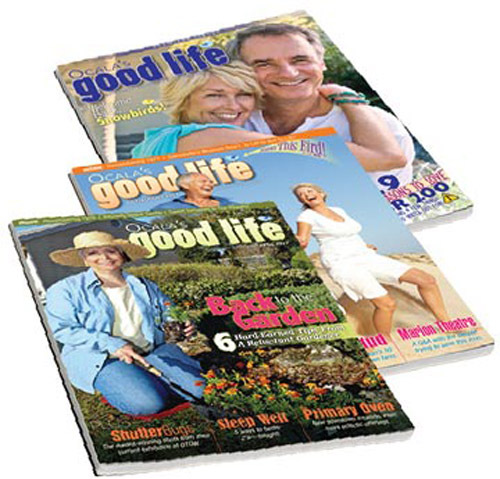 For advertisers wanting to reach seniors and retirees Ocala and The Villages, Ocala's Good Life magazine is the most cost effective, highly targeted print media in the area. Why spend money reaching those who would not be interested in your product. OGL is distributed in EVERY big retirement community in Ocala, even the gated ones. And 15% of our distribution goes into The Villages and surrounding areas.